The exact number of Chinese living in Josephine County was uncertain because they were not counted in the census. However, all Chinese were required to pay a polling tax if they wanted to look for gold. Using the Josephine County polling tax from 1865, it appears that there were about 433 Chinese in the county. It is likely that the majority of these individuals lived in Illinois Valley, the location where most of the mining and businesses in Josephine County were located during the Oregon gold rush. 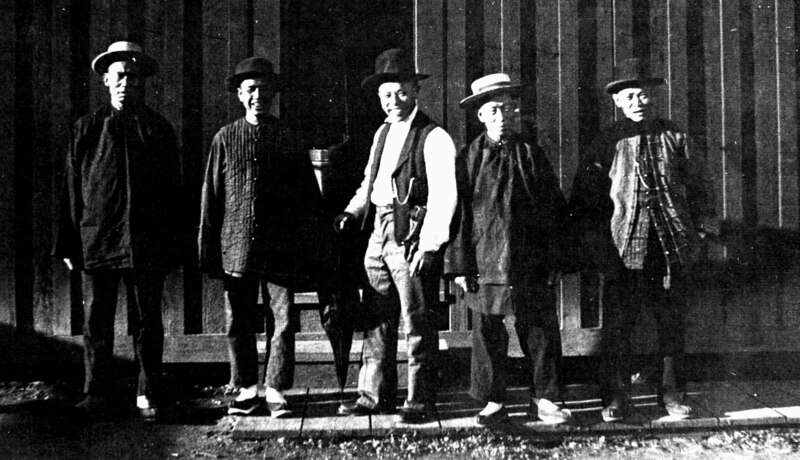 Few knew the English language and it is natural that they lived close to other Chinese to form a small community that was generally referred to at “China town.” The only such settlement in the early history of Josephine County was located in the mining town of Waldo. 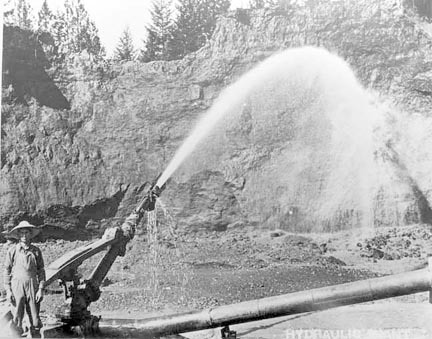 Chinese man operating hydraulic mining equipment near Waldo, Oregon. The Chinese were not allowed to own a mine and frequently did most of their gold digging in the areas where white miners had hurried through to find the largest nuggets, usually overlooking the smaller placers (gold dust) in their rush. The Chinese methodically sifted through what had been left behind. The Chinese were often hired to do difficult and laborious jobs. They constructed many of the early wagon roads, did labor at larger mining operations, dug ditches and other similar tasks. Not all Chinese worked in mining. In about 1856, Lee-Hang was appointed the deputy tax collector under first sheriff of Josephine County. 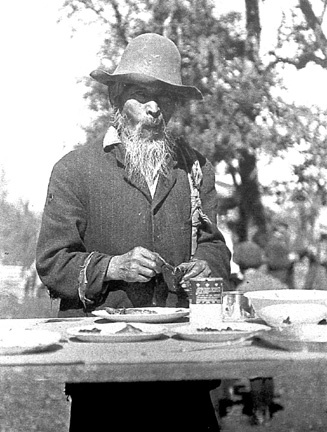 Gassy Bow was a packer who brought supplies to Illinois Valley from Crescent City. Jim Chow had a blacksmith shop at Waldo. Chinese children attended the same schools as other children in the valley. Jim Chow had two children, who attended the school at Waldo. Jim would sometimes go to the window of the school to watch his children. The teacher always invited him to come in but, for some reason, he preferred to stay outside and watch through the window. If there was a death in the Chinese community, the deceased individual was buried in the Waldo cemetery located on a hill about one half mile west and a little south from the site of Waldo. The separation of races is clearly shown there. Many pioneers rest in the cemetery at the top of this hill but the Chinese could not bury their dead there so, some distance down the hillside, they laid their loved ones to rest. In the late 1920’s or early 30’s, Chinese Tongs, or family groups, from San Francisco, hired workmen to dig up all of the Chinese bodies that could be found. The remains were placed in burial boxes, and taken to San Francisco where they were placed on ships to Shanghai. It can be assumed that on arrival in their native homeland they were buried. Gassy Bow, also known as China Bow, at a picnic in the early 1900s. It is an interesting note that one of the Chinese didn’t want his remains to be taken back to China so he asked his white friends to bury him in an undisclosed location. Gassy Bow may be the only Chinese that is still buried in this valley. Most of what we know about the Chinese in the early history of Illinois Valley has been passed on to us in stories told by the people who lived here during the gold rush years of the 1850s. The following is a compilation of stories and memories about Chinese customs from the people who observed them and, although these may not be accurate in every detail of Chinese custom, they do give us an insight to the positive way the Chinese were remembered by Illinois Valley’s early prospectors and farmers. In the town of Waldo, there was an area behind the store where Chinese residents built their huts in close, straight rows. This was probably the closest thing Illinois Valley ever had in the way of a “Chinatown”. On the nights of their feasts, many lighted Chinese lanterns were hung all over the little Chinatown and the noise of their firecrackers were heard for some distance. If you were invited as a guest on New Years, you would be met in the doorway and each of you would bow to the other and then turn around and bow to others who were present. This was continued until each one had bowed to everyone. Then you were given a treat of coconut or hard, white candy that had very bright colors mixed through it. The Chinese made some elaborate preparations for their New Years celebration, which made this an especially memorable event. They first sent home for immense firecrackers and while they were waiting for the arrival of these items, tin cans would be strung along the eaves of each house, side by side, from one end of the street to the other. Upon the appointed day, a giant firecracker would be placed in each can and each was tied to the other with a long fuse. Someone would go to the farthest house up the street and set the first one on fire. This would set off the next one and so on down the street to the end. This made one big bang after another. They also liked to place a large quantity of firecrackers under pans and buckets, which were thrown high into the air by the exploding firecrackers. After Chinatown had existed for a number of years, it all burned one night during one of their celebrations. That was the end of Illinois Valley’s Chinatown but, despite its short history, it has left us with many enjoyable memories. Haefner, Henry. 1975. Reminiscence of an Early Forester. In Oregon Historical Quarterly, March 1975. 39-88. IVN, 1937. The Last of the Chinese Here. Illinois Valley News, September 2, 1937. Mark, Steve, R, 2006. Domain of the Cavemen. National Park Service, Pacific West Region. p23, 27. Rigel, Leona, 1955. Early Day Customs of Old Chinese Settlement in Waldo Area Told. Illinois Valley News, August 25, 1955.